When Judge Edmund F. Dunne, founder of San Antonio, conveyed his homestead land to the Order of St. Benedictine in 1889, the town of Saint Leo was founded. That same year, the Benedictine Sisters established Holy Name Academy. The next year a post office was established. And in 1891, the residents voted to incorporate Saint Leo. The nearby town of San Antonio had been established a few years earlier as a Catholic colony, The growing population of Catholics, mostly of Irish and German descent, were one of the reasons the Benedictine Order decided to establish Saint Leo at this location. In 1906, construction on a new abbey was started. While it was still under construction, a three story building was moved from the north side of San Antonio to Saint Leo to be used for the new Holy Name Convent. The town of Saint Leo is currently home to a Benedictine Abbey and Holy Name Monastery. Saint Leo University is, however, the primary feature of the town. 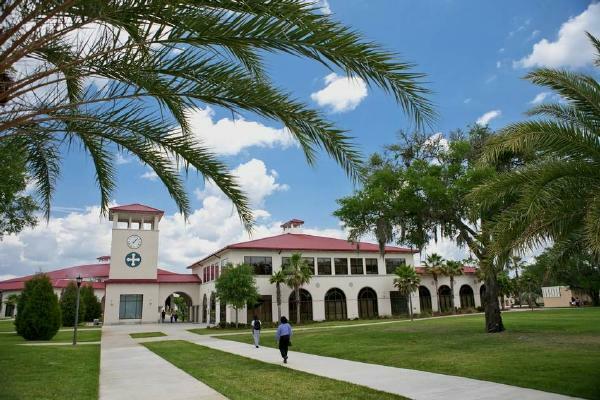 First chartered in 1889 as Saint Leo College, it is one of the five largest Roman Catholic colleges and universities in the United States. The Saint Leo Benedictine Abbey has a gift shop that is open to the public, They also welcome visitors at their guest house, where people of faith may get away for a monastic experience in a single or double occupancy room with meals included at the monastery dining hall. Advance reservations are required. The Abbey is also available for group retreats. See the Saint Leo Abbey link below for more information. Golfers will also enjoy the Abbey Course at Saint Leo, which is open to the public. The course offers a landscape of rolling hills with nice views, and some of the holes can be quite challenging. Adjacent to the pro shop is the Abbey Tavern, popular with locals for lunch and dinner.